We are sending off 2018 with a big hug, and starting 2019 with a recap of our Top 10 most loved Paleo recipes on Instagram. If you aren’t yet following us on Instagram, that’s where all the fun stuff happens first, and we’d love to see you there! In addition to these Paleo favorites, there are many more on our blog which you can search by keyword or category. Also, many of this year's Top 10 Keto and Top 10 Vegan recipes are Paleo too (and always always Gluten Free). The following recipes use our Paleo Energy Bite Mix (certified Paleo) and Primal Protein Bar Mix (certified Paleo-Friendly). Both are no-bake & minutes to make! Just click a link below to view YOUR favorite. Mix and roll 24 Balls. Then use a sifter to dust all your bliss balls quickly and lightly with schisandra berry powder! Line a 6" round pan with parchment paper and set aside. Make the crust first - follow the instructions on the back of our no-bake mix. Then press the mixture into the pan. Drain the cashews and place them in a high-speed blender or food processor with the pitaya, lemon juice, coconut, and maple or date syrup. Blend until smooth. Pour the cashew mixture into the pan on top of the crust, and spread evenly. For serving, let it stay at room temperature for 15 minutes until it can be cut easily. * One small to medium banana is approx 1/3 cup. Mix with a fork, press into a pan with a spatula, and cut 8 bars (or roll 24 balls). Roll into roughly 20 bite-sized balls. Chill to harden the chocolate covering (about 30 minutes). 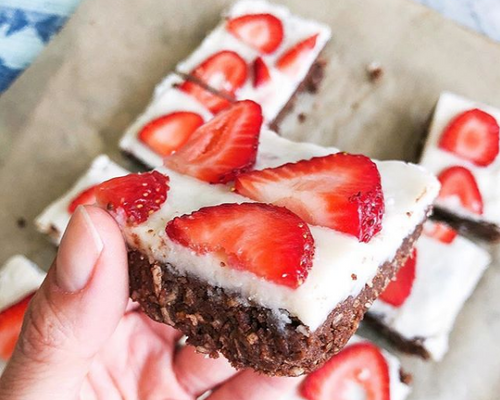 Place about 1/3 cup of the Paleo Energy Bite Mix in the bottom of your jar or cup, and mix with an equal amount of coconut yogurt until moist like brownie batter. Place a layer of fruit on top of the mixture in the jar. Place a layer of coconut yogurt on top of the fruit. Place another layer of fruit (like fresh blueberries!) on top of the yogurt. 7. Paleo Cocoa-Banana Energy Bars w/ Strawberry Coconut Butter "Frosting"
1 cup melted coconut butter for the "frosting"
Store in fridge to set before eating (about 30 minutes). In a medium-sized bowl, combine the energy bite mix, honey, and water (add your peppermint oil or extract to the water if making them minty). Use a fork to mix and mash, until it's evenly moist. Lay parchment paper on a baking sheet or cutting board. Roll mixture between your hands to form bite-sized balls. Place the balls on the parchment paper-lined baking sheet. Freeze the balls for at least 1 hour. In a small bowl, melt the chocolate. You can add a bit of coconut oil to thin the chocolate out - it makes it easier to dip the protein bites. Dip the protein bites into the chocolate dip, and place back on parchment paper. 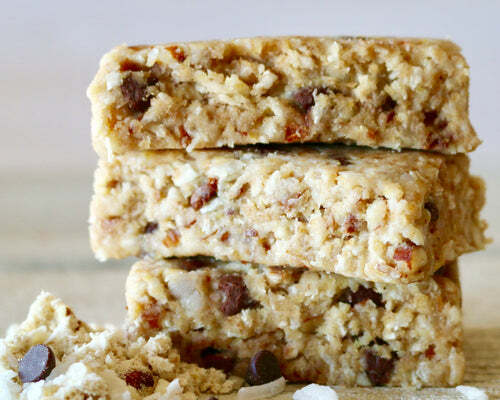 Immediately top each protein bite with coconut flakes (so they stick to the chocolate). Refrigerate for about 1 hour, or until firm. 1 bag Primal Protein Bar Mix "Whey Hip Chocolate Chip"
Mix, Roll, Have a Ball! We hope you enjoy these Paleo recipes for many years to come, and keep checking back for new recipes too!